For some reason – this piece makes me thing I am looking into a doll house. Probably the colors, the fact that a room was created, their doll like figures all contribute to this. Did I have this in mind when I started – indeed not. I just started. Open a blank screen, selected a rose toned backround. filled it with a patterned paper texture, liked it and thought “hmmm” – what shall I do next? Perhaps an antique settee with a lady draped across it. I sketched a little settee, put in the arch of a doorway. I knew I wanted the to create the illusion of depth and a room beyond. Looked back at my settee and within the shadows and pattern of the structure saw to women sitting there. That set my direction and I simply followed it. It is kind of a one step at a time kind of evolution for me to create this kind of painting. So, I added the structure of walls, the floor and decorated the room. I love texture as you can see. I think it is important to get something down on paper. It is less important to know what you are doing. When working from imagination, my “knowing” seems to trail behind my marks. It’s kind if like my life. I don’t wait to have everything figured out before I get going. I get going and then my life reveals itself to me. I am good with that. This image is full of vibrant color – which reminds me to remind you how important it is to calibrate your display often so that you can actually see accurately the color you are creating. X-Rites ColorMunki Display is the perfect device for you to use when you want an easy and affordable way to display your colors accurately. Learn more about X-Rite color management solutions. 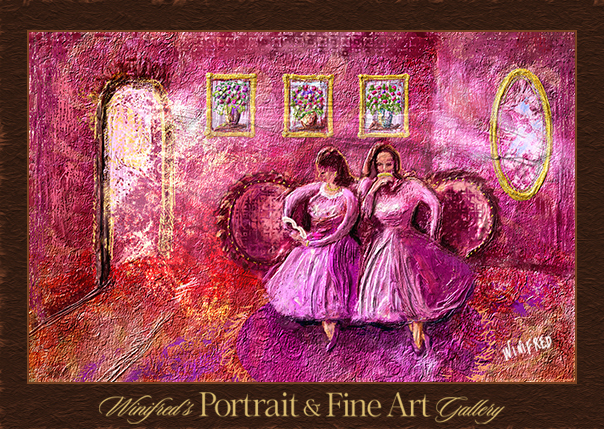 This entry was posted in Winifred's Portrait & Fine Art Gallery, Workshops and Training and tagged digital painting by Winifred Whitfield. Bookmark the permalink.